St. Anne is traditionally honored on Tuesdays. You are invited to make a perpetual private novena of Tuesdays in honor of St. Anne. In your intentions, please remember the Archdiocese of Detroit and Mary, Mother of Divine Mercy Parish. Please report any favors received in the comments portion of this page. With deep and heartfelt veneration I prostrate myself before thee, O glorious Saint Anne. Thou art that creation of privilege and predilection, who through thy extraordinary virtues and sanctity wast worthy to receive from God, the supreme grace of giving life to the treasure-house of all graces, blessed among women, Mother of the Word Incarnate, the most holy Virgin Mary. Deign therefore, O most compassionate Saint, for the sake of this lofty privilege, to receive me into the number of thy true followers, for such I protest I am and desire to remain so long as I may live. Surround me with thy powerful patronage, and obtain for me from God the grace to imitate those virtues which thou wast so abundantly adorned. Grant that I may know and bitterly lament my sins. Obtain for me a most lively affection for Jesus and Mary, and fidelity and constancy in the practice of the duties of my state. Preserve me from every danger in life, and assist me in the moment of my death, so that safe in Paradise, I may unite with thee, most blessed Mother, in praising the Word of God made man in the bosom of thy most pure child, the Virgin Mary. O Glorious St. Anne, filled with compassion for those who invoke thee and with love for those who suffer, heavily laden with the weight of my troubles, I cast myself at thy feet and humbly beg of thee to take under thy special protection the present affair which I commend to thee. (State your petition.) Be pleased to commend it to thy daughter, the Blessed Virgin Mary, and lay it before the throne of Jesus, so that He may bring it to a happy outcome. Cease not to intercede for me until my request is granted. Above all, obtain for me the grace of one day beholding my God face to face, and, with thee and Mary and all the Saints, of praising and blessing Him for all eternity. Amen. The image on this page may be downloaded for personal and devotional use. Blogs who wish to use this image must credit the image to Jenna Gambino. To use the image for some other kind of publication, please contact: cdin54@yahoo.com to obtain permission. Was this image of St. Anne created just for your church/diocese? Or was there another reason for its origin? 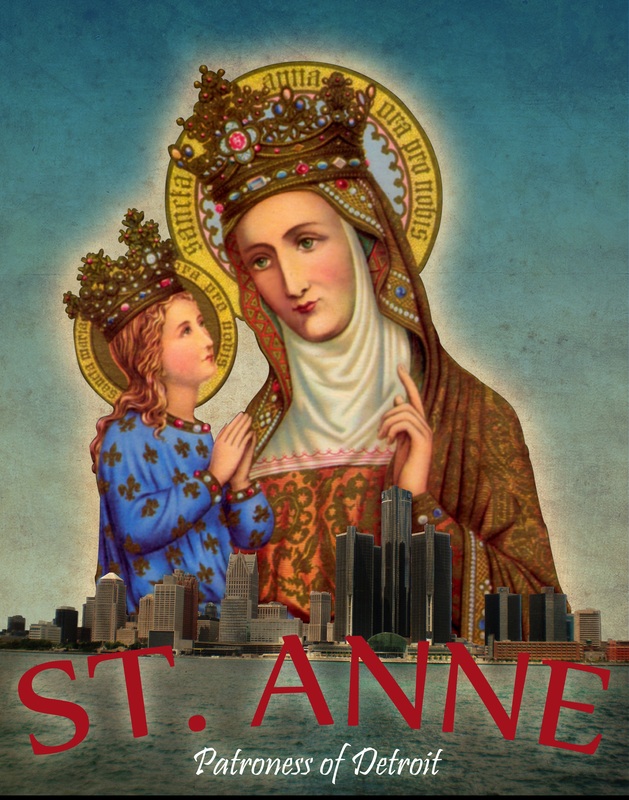 The picture was created to commemorate the Vatican’s approval of St. Anne as the patron saint of the Archdiocese of Detroit. She used a ready made image of saint, a photo of the city of Detroit and made this graphic design to reflect the saint’s role as patroness.